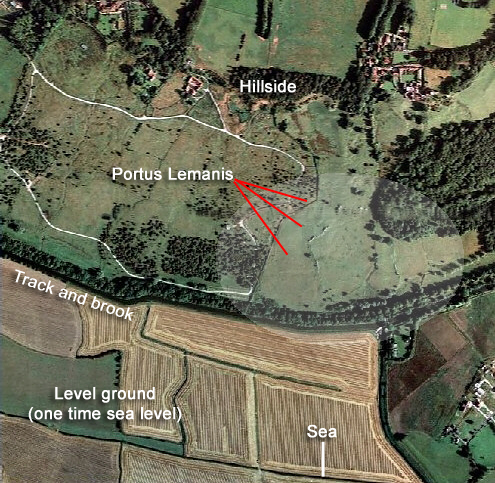 The fort at Portus Lemanis from the hillside - the home of the Classis Britannica? Below, looking SE toward Dymchurch, is the reclaimed plain where the tide ebbed and flowed some millennia ago . I visited the remains of the fort at Portus Lemanis (a.k.a. Stutfall Castle) in the high summer of 2004; it was hot and sticky as I struggled through a disused path of brambles and nettles on a slippery hillside (image 1) beneath the mediaeval castle to get close for a couple of images. It seems a neglected monument on a lovely spot and my researches have uncovered surprisingly little about the fort apart from two interesting prints. At the site you can see from my pictures that there is not much to see apart from the surviving bits of walls (2,3&4) at strange angles and moved by gravity from their original positions (on private land, BTW). This hill slippage is due to the geology of the area: Upper Greensand, Gault clay, Lower Greensand and Wealden clay. These all slide over one another aided by several streams outing from the escarpment making landslides a frequent occurrence since Roman times. 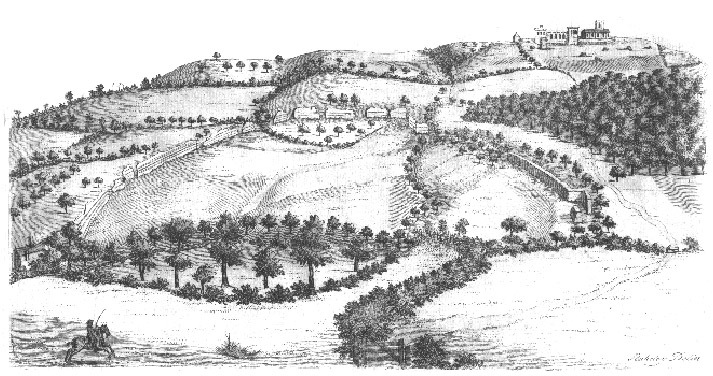 The unstable nature of the escarpment may have been the reason the fort and port was disused as a naval base. 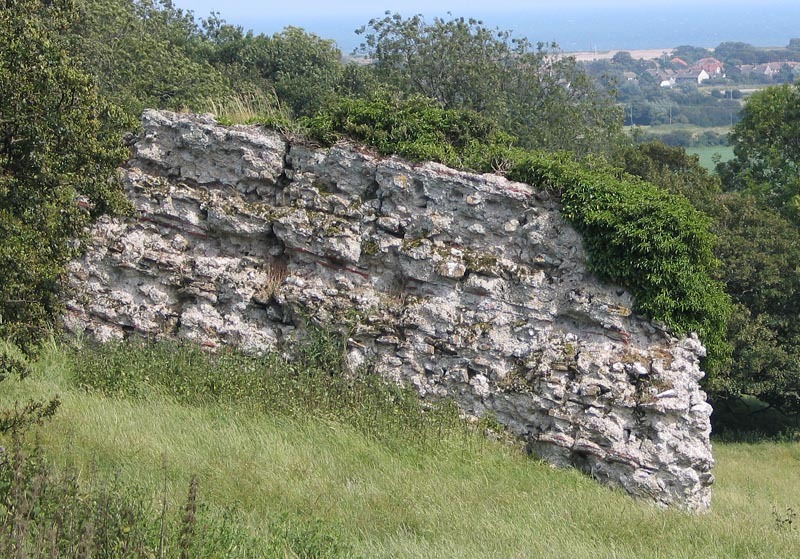 Ragstone from the lower Greensand may have provided the rock for the buildings and forts in this part of Kent. Geology map. 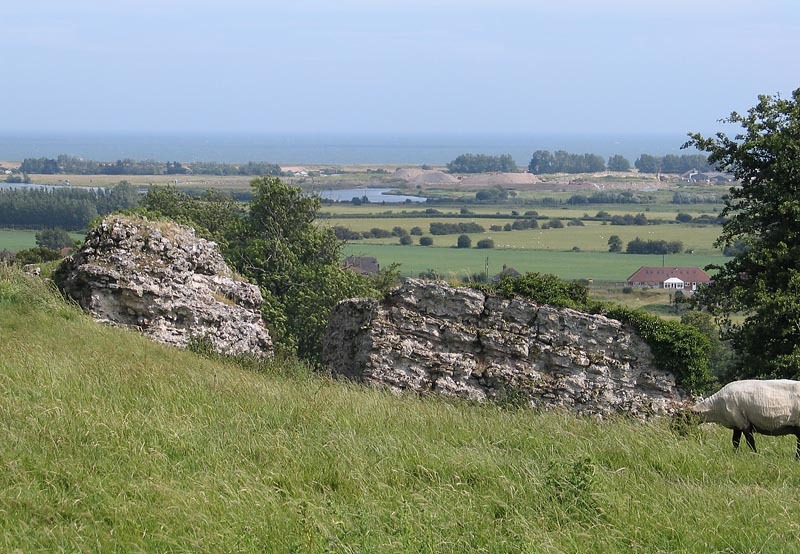 The fort was one of the Saxon Shore forts like Richborough built for protection from raiders in the late 3rd century. The walls, 3 or 4m. thick at their base, would have stood over 6m. high and stood on oak piles sunk into the clay; they also have the usual tile bonding courses and bastions on the corners . Detsicas' plan (above right) has the fort being square but it seems to be, in fact, the shape of an irregular pentagon enclosing an area of up to 10 acres. The Saxon Shore fort developed from an earlier base. The port, I guess, must have been in the area running from the West Hythe car park to the base of the hill below the fort (see aerial image 1) east a few hundred metres where the sea would have reached in those times. 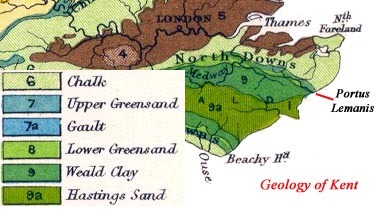 The coastline looked very different in those days with Portus Lemanis at the entrance to an inland lagoon and wetland behind a shingle beach that had built up from Fairlight (Hastings) almost to the port. The port served the Weald industrial area - iron mining and smelting - close by to the west with the rivers Rother and Brede providing access right into the heart of the Weald. 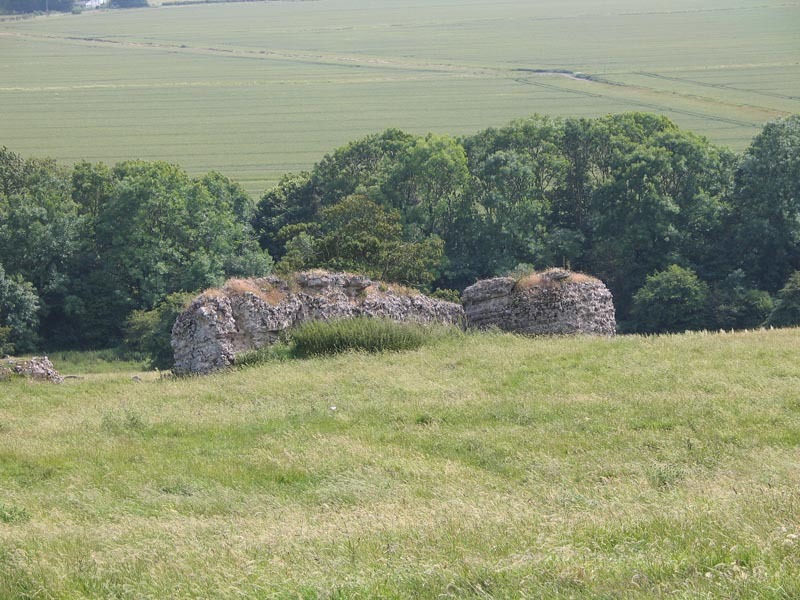 Whatever went on at Portus Lemanis, the export of iron and timber from the Weald and even salt from panning on the Romney Marsh, it was mentioned as a port in the ancient libraries and itineraries; a vicus is bound to have built up around the port to serve it and the garrison. 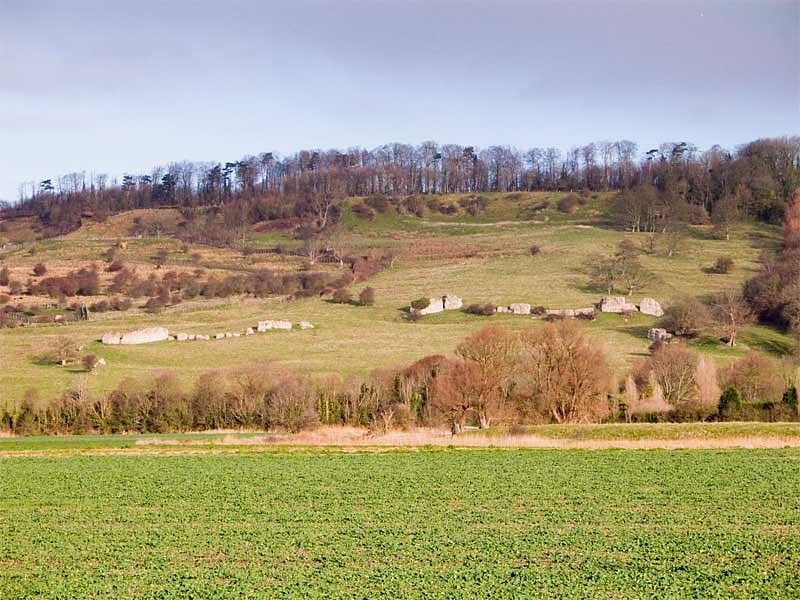 Roman settlements are also believed to have been at Ruckinge (inland) and Dymnchurch (opposite). The connection with Canterbury is impressive: a beautifully straight Roman road called Stone Street still runs from north of nearby Hythe into the city to this day. The Notitia Dignitatum, one of the early sources I mentioned, reports another military unit at the site Praepositus numeri Turnacensium, Lemannis meaning: "The Leader of the Company of Turnacenses at [Portus] Lemannis." 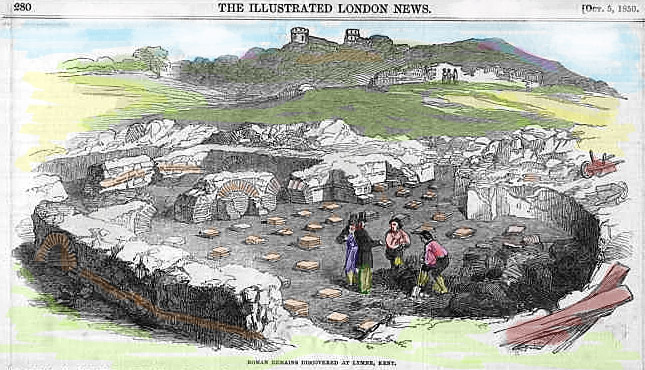 Charles Roach Smith's excavation which found the once barnacle encrusted altar stone above was reported in an issue of the "Illustrated London News" of 1850 along with an excellent contemporary etching/woodcut (right). Originally a black and white image, I coloured the line print to highlight the hypercaust tiles which reveal this must have been the soldiers' or officers' bath house. The print shows more than is visible today including the wall in the far distance which is no longer standing. Another etching or woodcut from even earlier time, taken from a book called Itinerarium Curiosum by William Stukeley, ca.1716, reveals the walls complete with lacing tiles and the west gate. Of course, much of this masonry will have 'robbed out' and ended up in later buildings. This print shows that the fort, with most of its wall standing, was not square in shape as Detsicas draws in his book but appears more nearly semi-circular. The pentagon theme is echoed in a sacellum found on the site which is also pentagonal.